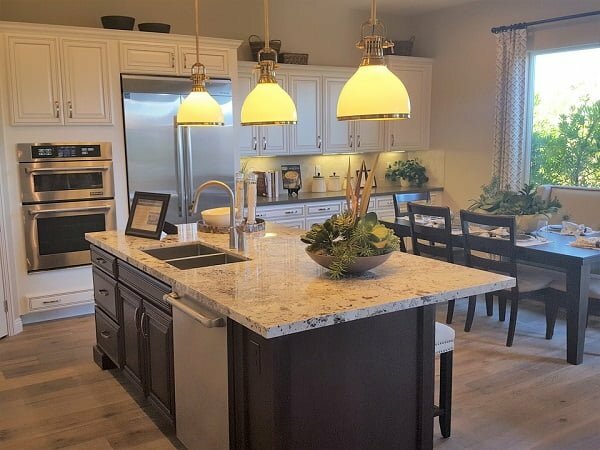 Want to take care of your kitchen lighting once and for all? It’s not a simple matter, and it does take trial and error. These rustic kitchen lighting ideas will help you get it right. Updated for 2019. Lighting is one of the most important aspects of interior design and home decor. Get it right, and your room will look great even with mediocre design (though, we know your home design is great!) But get it wrong and even the best designer won’t help you. That’s even more so important with the kitchen lighting. You have two main goals when lighting up the kitchen. First, you need to have enough light to accommodate your cooking at all times. And second, the kitchen needs to look pretty too! Seems like a challenge? It sure is. But don’t fret, here are 15 sure ways to get kitchen lighting right every time. 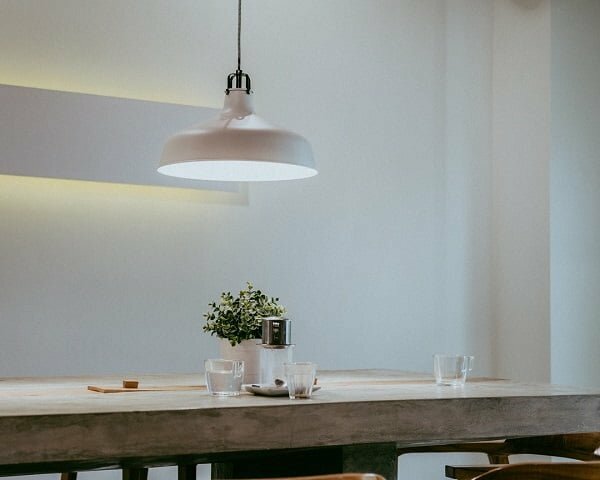 Farmhouse style is all the rage in home decor these days, so no wonder we have this lighting idea on this list. It’s simple – get a few farmhouse style pendants over your kitchen island or the dining table for a lovely look that’s worth Instagram. This is a very specific idea that has to do with working around rustic ceiling beams. Not every household has them, by far. But if you do, take it as a blessing. There are several ways to use them with lighting, but this one involves recessed lighting, which does two things. First, it’s the perfect overhead kitchen lighting solution. Second, it emphasized the beautiful rustic beams as a decor feature. Mixing different decor styles is almost always a guaranteed win. That is if you don’t go overboard. 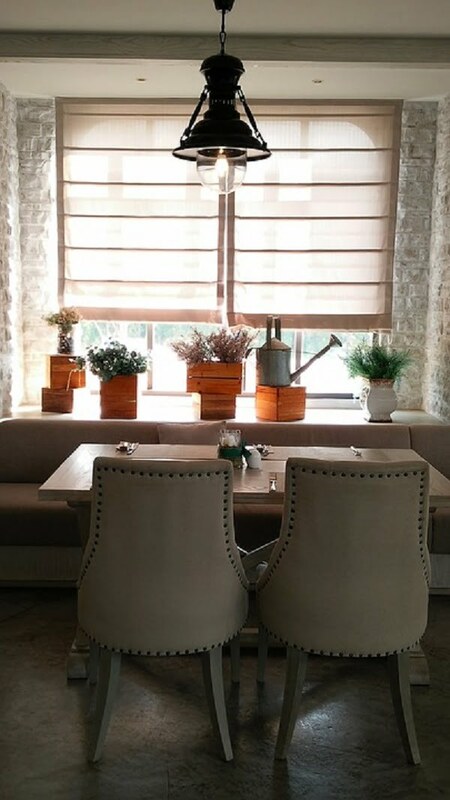 For example, having one industrial style lighting fixture works well in rustic decor. 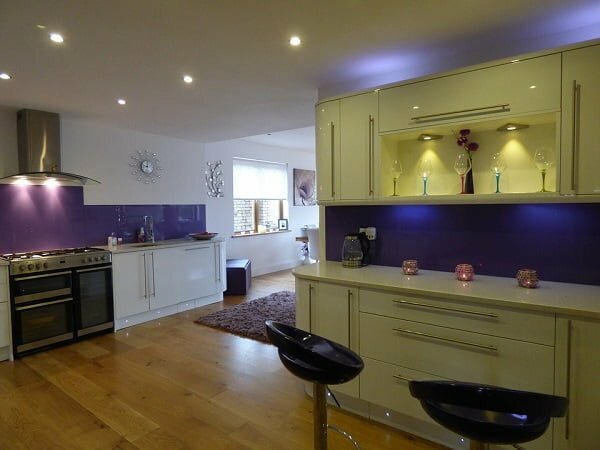 Want to add lighting to your kitchen in a unique non-boring way? Try this. Get a scone (even a table lamp will do) and install it on the open shelving. It does two things. It adds another excellent lighting layer, and it exposes your shelves as a feature. All you have to do is make sure your shelves are display-worthy. This is another beautiful farmhouse or rustic decor lighting idea. The lantern pendants are so charming. The artificial candlelight is so cozy, and it can be achieved with LED lights. You have to try this idea if you’re going for the farmhouse look. We’re all for layering your lights because it helps create magical decor. In other words, it enables you to spotlight the best features of your interior. Accent light bulbs do that well. You can add them just about anywhere you want to create a feature, and they make your decor interesting. Adjustable height pendants work best in this case. You can adjust them to the height you need at a given moment easily. They provide a lot of lighting when needed, and they look visually good. The best part is, there are many options available to choose from. It would seem that crystal chandeliers are a thing of class and luxury and there’s no place for them in the kitchen. But let’s try that again. 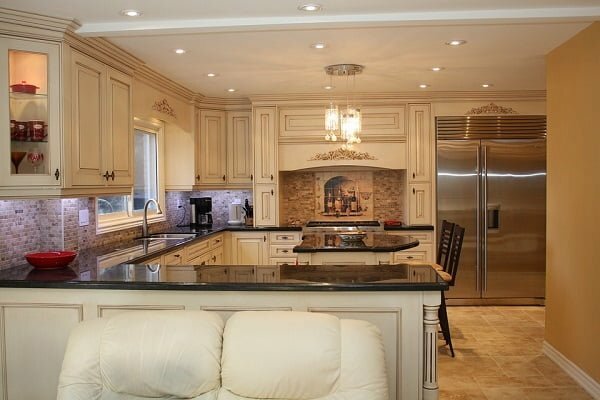 This kitchen doesn’t seem odd with such a chandelier at all. And it provides an attractive and functional overhead lighting at the same time. We’ve seen a lot of metallic accents in home decor in recent years. And we don’t mind them at all. 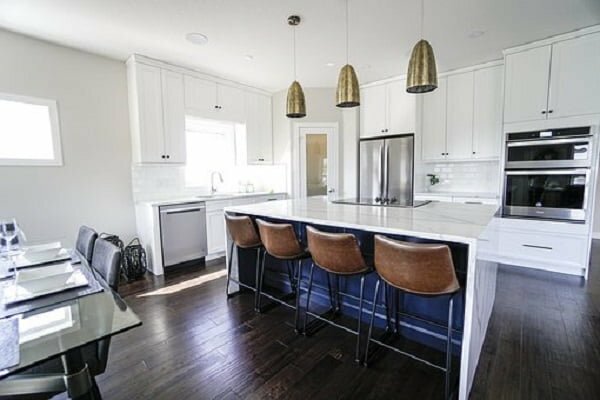 They work perfectly well in the kitchen, and you can do well with a nice three-pack of these pendants over your kitchen island or bar. It gives the area a modern but exciting look. 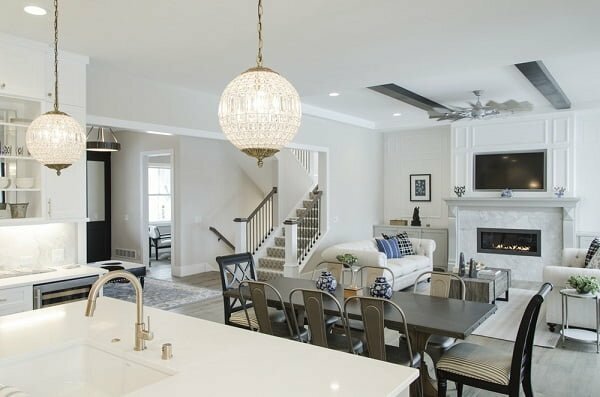 Orb chandeliers are another way to add kitchen lighting that looks unique. 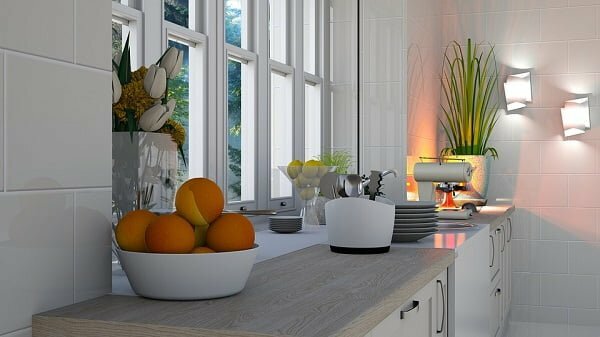 You wouldn’t usually expect to find them in kitchen interiors, and that surprise is what interesting decor is all about. It certainly helps create a character in a room. 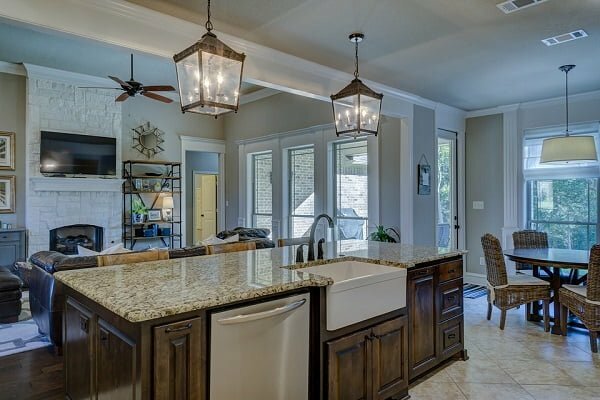 Rustic lighting pendants are almost the default go-to option of kitchen lighting. We wouldn’t mind if builders used them to install the default lighting at all. They help create cozy warm lighting in rustic decor, and they can even be a statement accent in modern decor. Your open shelves deserve to be lighted. That is if you have something worthwhile to display. 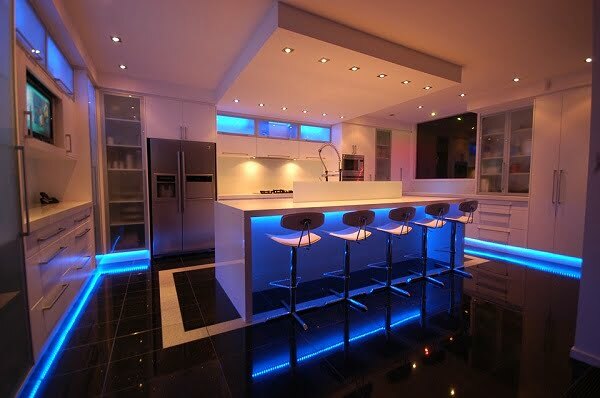 Let’s assume you do; then you owe it to your kitchen decor to install LED lighting over your display. 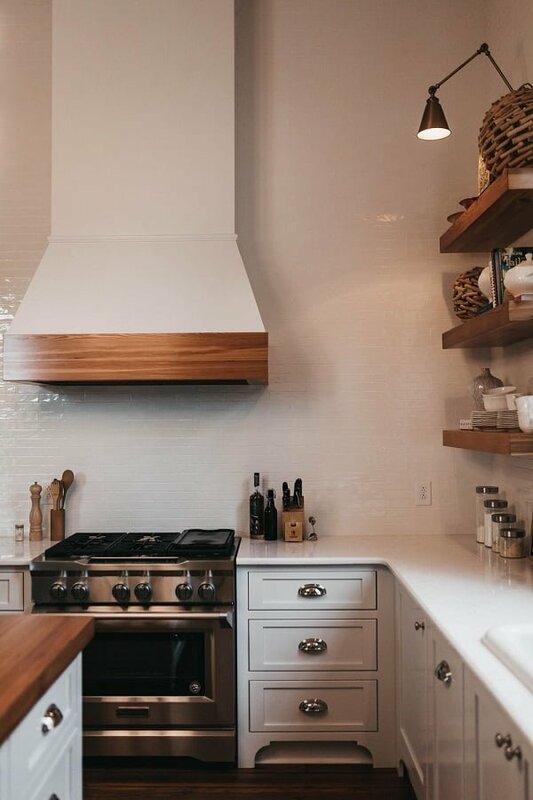 You can have as many wall sconces as you like (and need) in your kitchen as the middle lighting are. As this layer is at the eye level, it has to be dim, and it serves as mood lighting. 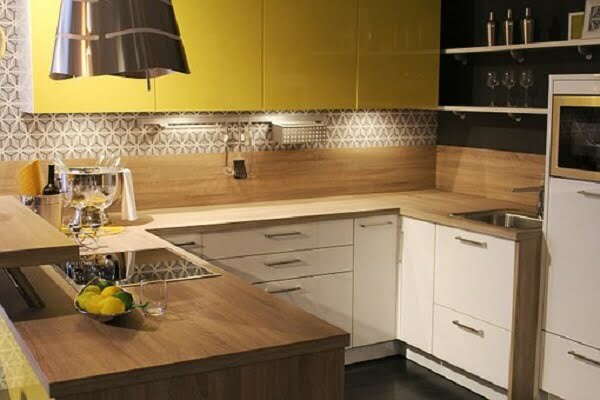 It also serves as a decor accent which makes your kitchen interior visually interesting. 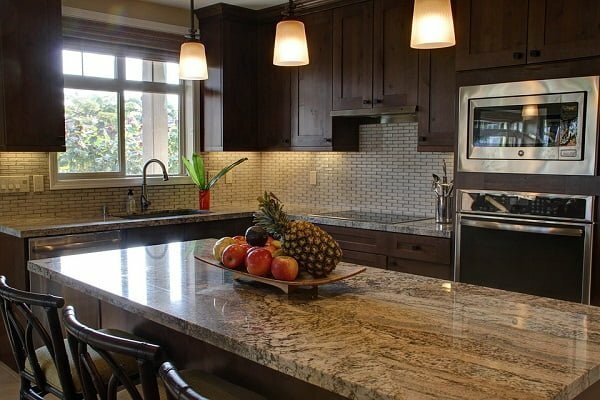 Ideally, your kitchen backsplash must be lighted for the most comfort in the area. After all, you want as much light as possible fall onto your countertop when you’re preparing food. LED lights under the cabinets work best as the lighting solution. You can even use strip lights. 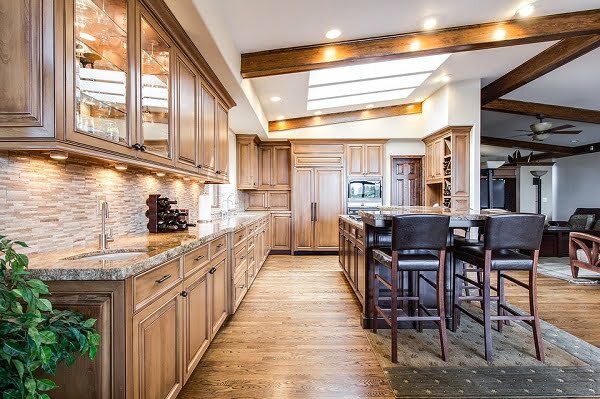 Floor lighting is often overlooked, but it’s a great way to layer your kitchen lighting. You can use LED light strips to light up the floor edges. 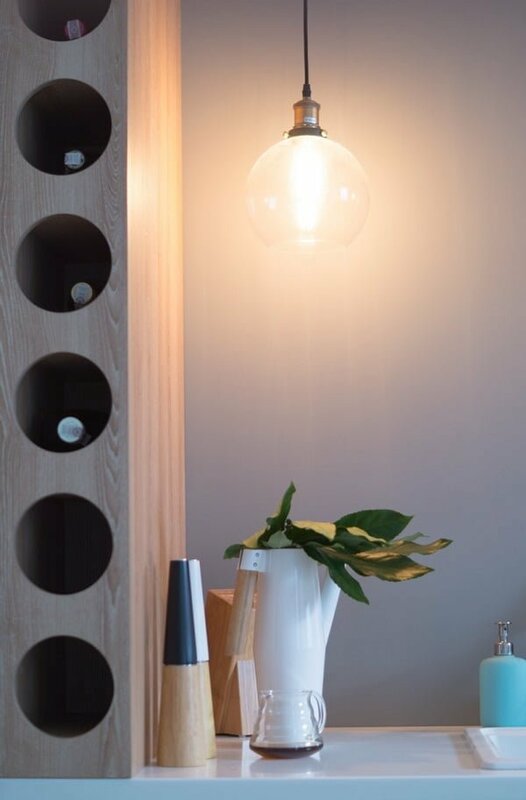 As a unique accent, try lighting the kitchen bar as well. It will give your space an edgy home bar look.